Are you looking for a world-class midsize sedan that will upgrade your day-to-day commute? You will be hard-pressed to find a better alternative than the next-generation 2018 Toyota Camry. 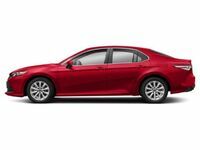 A fan favorite at Downeast Toyota, the Toyota Camry is athletic, attractive, innovative and affordable. Explore the advantages and benefits of the Toyota Camry in this 2018 Toyota Camry vs 2018 Ford Fusion comparison. Drivers who choose the 2018 Toyota Camry will have a choice of five standard trim levels – L, LE, XLE, SE and XSE – that can be tailored to fit your needs. Individuals who want more power can upgrade performance in the Camry XLE and Camry XSE with a more powerful six-cylinder power core. With room for five passengers and 15.1 cubic feet of cargo space, the Toyota Camry provides the versatility and space that your family needs. What Are the Differences Between the Toyota Camry and Ford Fusion? When it comes to choosing a brand-new car, price and affordability are key factors that are important elements in this 2018 Toyota Camry vs 2018 Ford Fusion comparison. 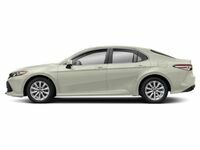 With a starting price that stands at $23,695, a more powerful, fuel-efficient engine and a smorgasbord of standard features, the Toyota Camry represents an incredible value when compared to its frugal-minded Ford competitor. Inside the 2018 Toyota Camry cabin, you will find yourself faced with an incredible wealth of next-level technology and features that will upgrade safety, entertainment and style. A standard 7-inch Toyota Entune™ 3.0 touchscreen display provides access to Bluetooth and Connected Navigation Scout® GPS Link technology. Toyota Safety Sense™ is a standard fixture that will upgrade family safety at every turn. Available interior upgrades include premium leather upholstery, a 10-Inch Head-Up Display, a 7-inch Multi-Information Display, Wi-Fi Connect and much more. Armed with upgraded powertrains, the Toyota Camry will improve power and fuel economy numbers that the Ford Fusion struggles to match. A highlight of the updated Toyota Camry design is an eight-speed Direct-Shift automatic transmission that takes performance to another level when paired with Toyota New Global Architecture.